All the natural harbours of the region being firmly hold out by the Germans, attempting their head-on capture was not conceivable. The Allies would indeed risk being pushed back to the sea as they had already been so, on August 19th 1942 : the tragic experience of Dieppe suffered by the Canadians and British should reoccur. Hence the following brainwave : “bring in their luggage, just towing it, an in kit form harbour, the elements of which were prefabricate in Great-Britain prior to the landing. It will merely be necessary to put them together in Normandy. 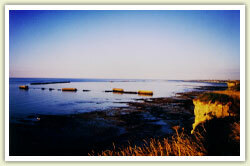 Once the Germans withdrawn inland and the coast under allied control, the largest towing operation could start. An artificial roadstead (breakwater) provided the ships with a shelter worthy of the largest harbours, as well as with floating installations that matched indeed even outmatched the highest-performance harbours’ in unloading capacity. Put together in record time in front of Gold (British sector) and Omaha beaches (American sector), these artificial ports are one of the keys of the successful landing. 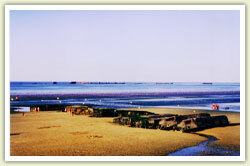 Of British conception, the artificial harbours remain one of the most prodigious and unexpected achievements of the military Engineers’ History.